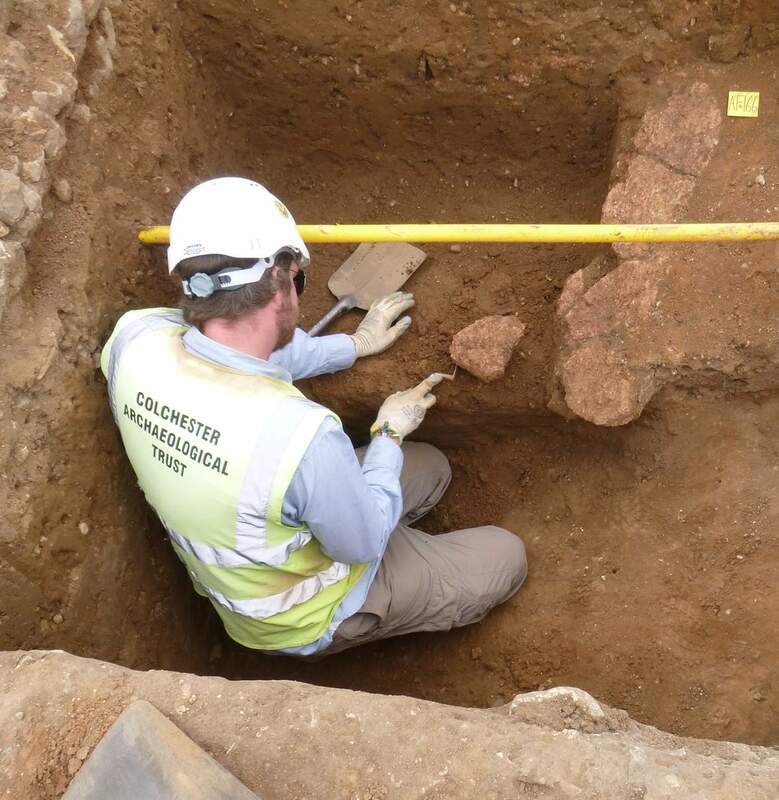 The excavation team were investigating a large Roman pit when they identified a square-ish feature on the site of the circus’ central barrier (spina). When they started work on this feature, they uncovered some large fragments of opus signinum. They then uncovered a strip of eight joining fragments of the same mortar: this was about 80 cm long. Further along there were a few more large fragments. The large fragments of mortar were all on the same level and we realised, when we had fully excavated the feature, that they had been lying in a line near the top of the backfilled feature. The feature was an underground chamber, possibly a water-tank or a sump for the draining away of water, and it was part of the spina. This chamber is at the eastern end of the spina; previously we have discovered a similar chamber at the western end of the spina, and which was found near the remains of a Roman water-main. These underground chambers seem to have been associated with the above-ground water features of the spina* and themselves must have included above-ground, visible elements, as the surface of the mortar fragments had been painted. The fragments seem to represent rendering from a wall, including parts from the base of the wall and some slightly curved fragments which may represent rendered coping. They are more tiny surviving pieces of the massive structure that was the Roman circus. 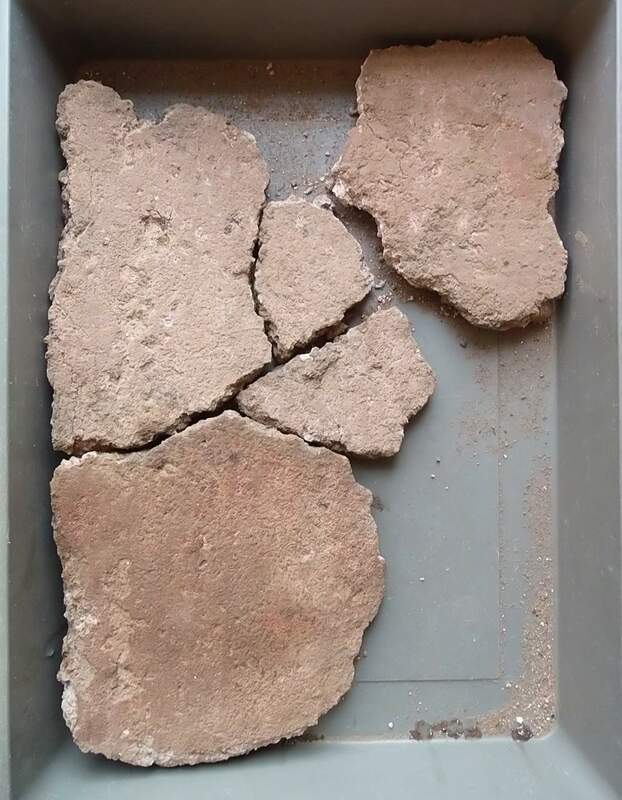 The fragments of mortar vary in thickness but some are over 3 cm thick. Their surface was quite roughly smoothed and painted red. 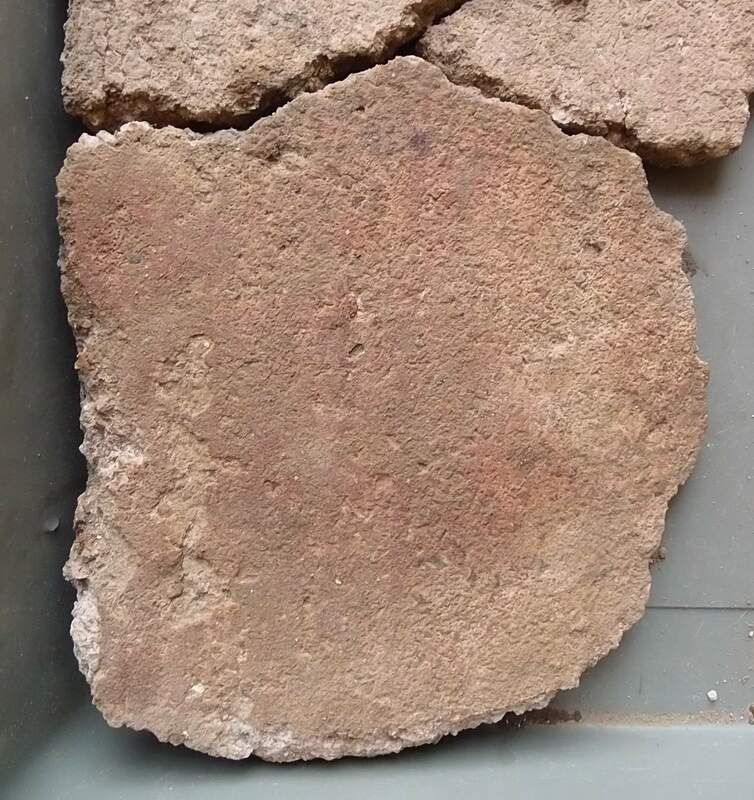 The mortar would have been used to render a wall and the fragments are heavily weathered. Trust director Philip thinks that, because of their size and the way they were found, these large fragments do not represent demolition debris. The fragments lay painted surface down in the ground, as though the structural element or structure which they derive from was fairly intact and just collapsed as the circus deteriorated. But we don’t know what it was – yet! 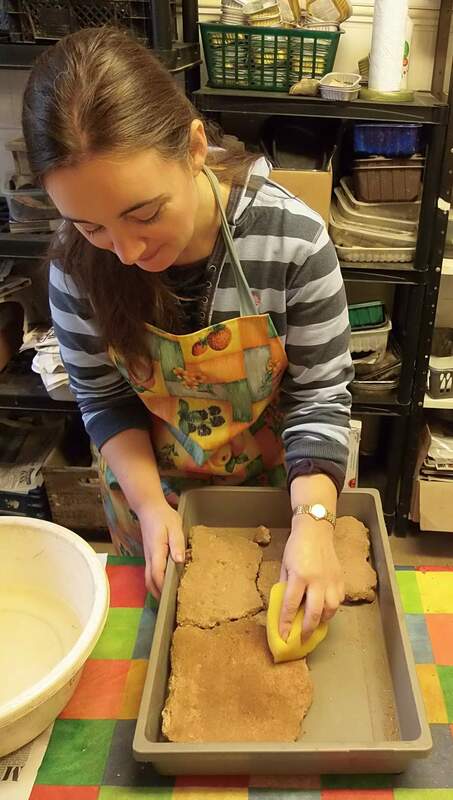 We are planning to put these fragments of mortar on permanent display in the Roman circus centre. Trust archaeologist Mark Baister supervised our Flagstaff House site. The images show Trust excavator Robin with some of the fragments of mortar in situ, below a modern gas-pipe; Jane cleaning a large fragment of the mortar; one of the trays of mortar fragments; and the cleaned fragment in close-up. * The spina would have included monuments and large basins of water, with a turning-post at each end of the spina which each consisted of three large cones on a base. Large figures of dolphins and eggs functioned as lap-counters and were operated using pressurised water, so Roman circuses would include water-supply systems. Some Roman circus spinas also featured fountains. The basins of water were not just decorative as, apparently, circus attendants would throw water over the horses or the chariot wheels during races (Roman circuses: arenas for chariot racing, by John Humphrey, 1986).